Project Merlot's third visit to Rockingham Motor Speedway was on 29th October. 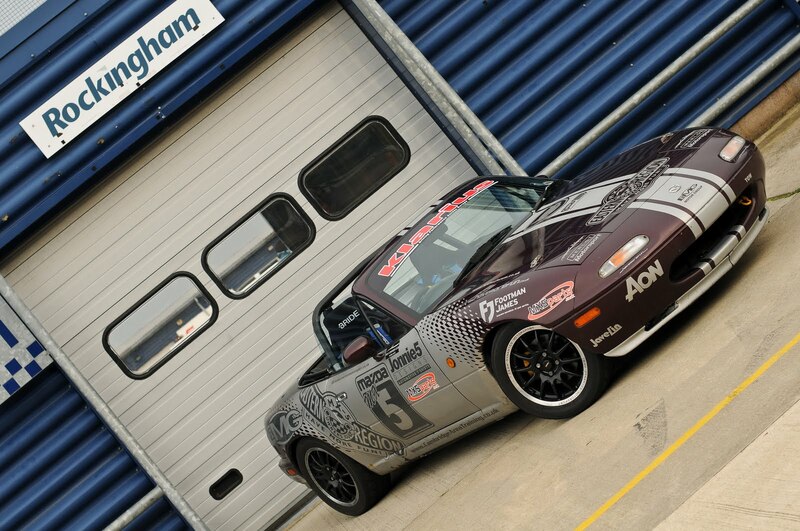 The event was organised by Mazda on Track in association with Rockingham Cars. 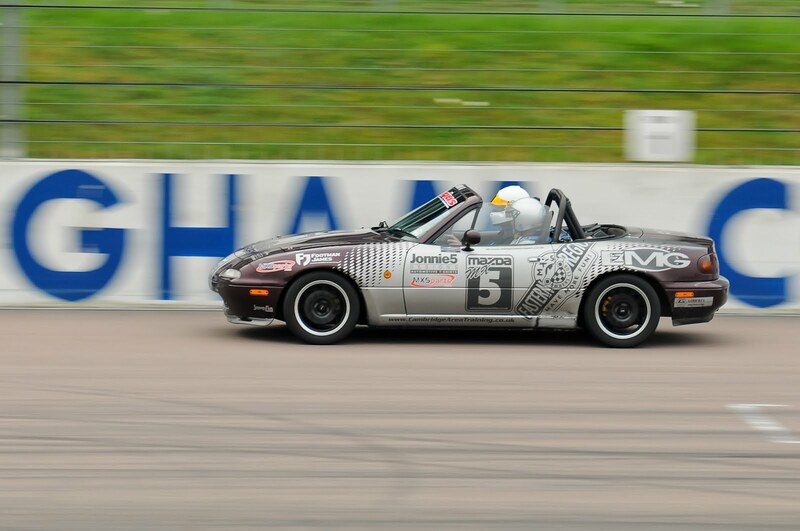 With the car sporting decals for its new sponsor MX5Parts, Robbie and Jon took to the International Long circuit. The new-to-the team circuit configuration brought fresh challenges to enjoy; having two extra tight hairpin bends and a fantastic chicane after the turn in off the banked section meant there was a great mix of fast and slow corners. After seeing "sparks" emitting from the right hand front wheel under heavy braking, the pad wear was closely monitored during the morning session. Just after lunch the cheap after-market front pads had nearly worn down to the back plates (apparently wearing out about 6mm of pad material) so a used set of pads was fitted to finish the day. The EBC Redstuff pads and Turbogroove discs kindly supplied by MX5Parts will be fitted next. 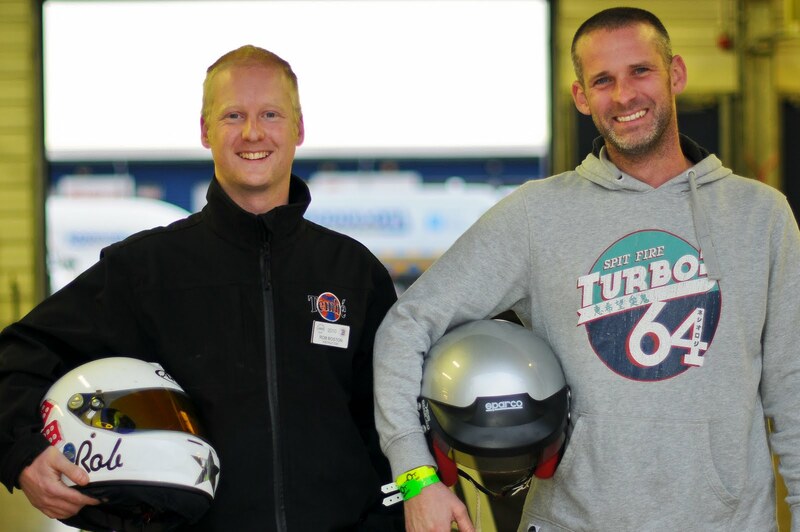 Jon said: "It was one of the best track days we had ever been on, with good etiquette on track, no incidents, we were driving well and the Merlot was behaving itself while holding its own against much faster cars." 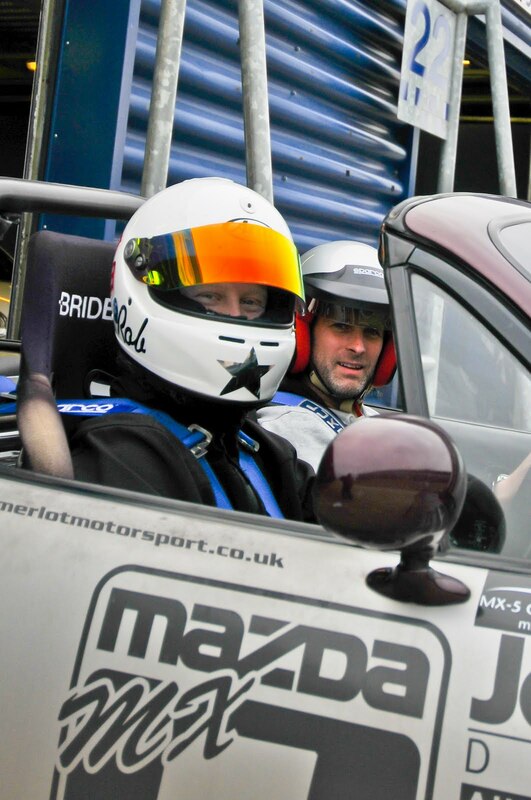 But the clear highlight of the day for both drivers was spending time with Rob Boston, who took to the driver's seat of Project Merlot to give Robbie and Jon a taste of what the car can do when in the capable hands of Ma5da Racing's 2010 MX-5 Champion. Robbie said: "Without needing time to become accustomed to the car, Rob was turning in off the banked section of the circuit in 4th gear at speeds in excess of 90mph, a turn that at 60mph I thought was very good going." Jon said: "Rob was constantly making corrections on the steering wheel but the car was absolutely as smooth as can be. I said to Rob afterwards that I couldn't believe how much he constantly corrected the steering to get the right lines, while the car was always in control. He said that was the key to achieving speed- being smooth yet committed. "In Rob's hands, we were convinced we had the quickest car on the circuit which was borne out by the fact that the local dealership had brought along two race cars (a Fiat 500 and a Mazda MX-5 Mk3 which had recently been entered in the Britcar 24-hour race) and both were being driven by former British Touring Car drivers to give people fast passenger rides. Yet when I wet out with Rob we were going so quickly that when we came up behind the race MX-5 Rob had to back off to give them space to accelerate away. Then we caught them up again and overtook them in our basically standard road car! It's obvious to me now that you don't need to spend thousands adapting your car to be quick. You're better off spending your money on driver tuition to become a better driver." Rob said: "The car was fantastic, just lacking a limited slip diff - and the rear view mirror kept dropping down." After hearing what Project Merlot was all about, he said it was a 'brilliant idea'. The Project Merlot team agree with the limited slip diff observation, but say but the mirror issue was just due to Rob using every kerb on the circuit! that and cojones the size of melons the way these guys enter corners. Read all about it in Soft Top Hardtop.